Leasing Available from $13.45 per month! Leasing Available from $18.29 per month! Leasing Available from $20.29 per month! Looking for Xerox Phaser 4600 Parts? Engineered for workgroup demands.Your business relies on speed and flexibility, and your new Phaser 4600/4620 printer offers world-class print speeds that don't sacrifice quality. Higher performance. A fast print speed of up to 65 ppm keeps your work moving. Quick output. See your first page in as few as 7.8 seconds. See the difference. With image quality of up to 1200 x 1200 enhanced image quality, your documents show exceptional sharpness and clarity. Built to last. With a monthly duty cycle of up to 275,000 prints, the Phaser 4600/4620 is all about heavy-duty production. The quiet partner. Engineered for extra quiet operation to minimize impact on busy offices. Your prints, your way. 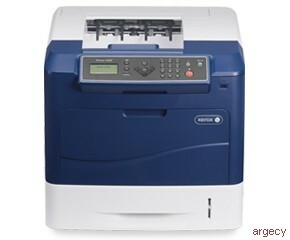 Get a huge variety of print options with the Xerox Phaser 4600/4620. Keep it simple. The easy-to-understand front console and automated setup get you printing in minutes. Print on everything. The Phaser 4600/4620 easily handles everything from transparencies to cardstock, envelopes to labels. More paper, more options. Load the main tray with up to 550 sheets of paper ranging in size from 3.86 x 5.8 inches to a full legal-size. Automatically staple up to 50 sheets. The optional 500-sheet finisher further extends the Phaser 4600/4620 printer's productivity. Manage complex documents easily. Get standard memory capacity of 256 MB or the optional expansion to 768 MB.Help your budget and the environment.Your savings never end with the Xerox Phaser 4600/4620. Value-priced from the start, it continues to keep costs down with sensibly green conservation options. Cut your paper consumption in half. Highly efficient, no-hassle two-sided printing saves money and paper.Extend your paper conservation. N-up printing lets you group multiple pages on a single sheet. Replace only what you've used. Our split consumables let you get the most out of every user-replaceable component. Waste less. The long-life marking drum lasts longer and requires fewer replacements.